Thrills by the Bay: Gold Striker Nearing Completion! I'm back with a mini update as Gold Striker nears its completion. Testing should happen real soon. In the mean time, let's take a look at some of what's happened over the past week! 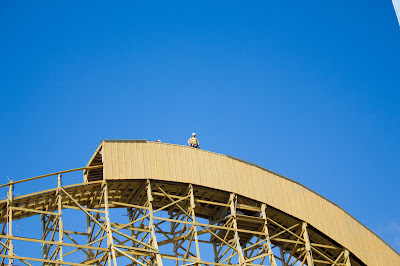 One of the most noticeable differences coming up to Gold Striker is the now shiny roof! You have been warned, it will produce some bright reflection later in the afternoon if you happen to be walking up to the park gates. The top has been covered with corrugated metal. From inside the park, there were people working on it this past Sunday. In all of my visits to the park since construction started, the site remained quiet on Sundays. The worker is standing at the highest point on the coaster. Lift crown ornament anyone? 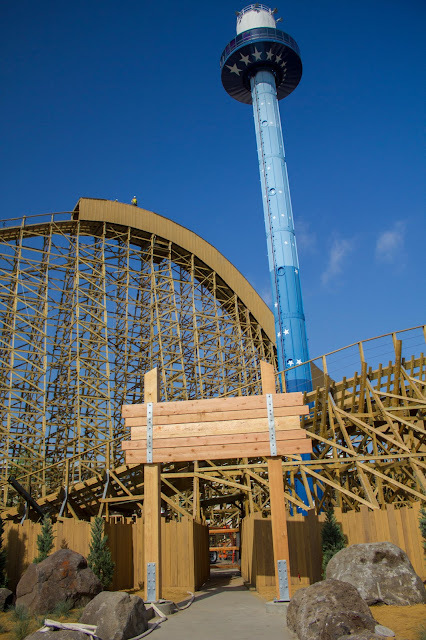 Also inside the park, those thick posts we saw last week were indeed sign posts. Obviously the sign hasn't made it onto the board yet but should be real soon. 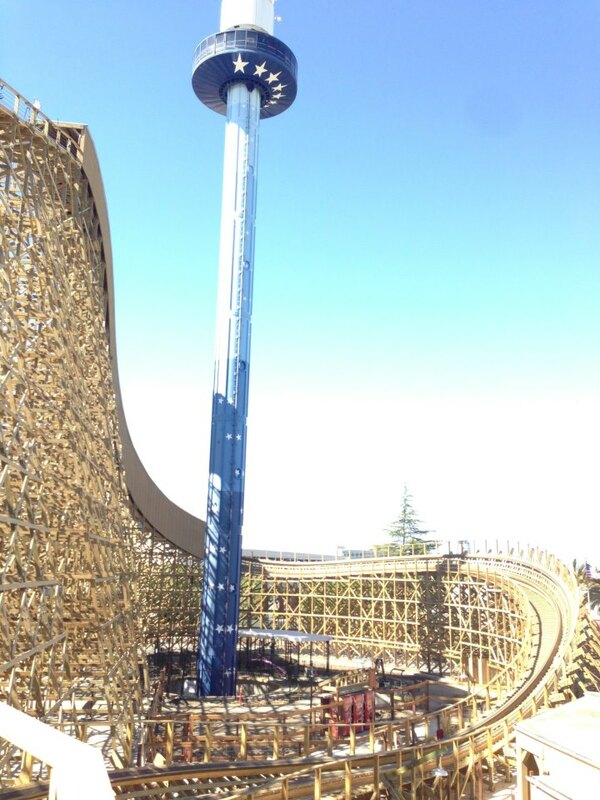 The entrance to the ride is looking quite striking in itself! Looking over at the station, not a whole lot has changed. Soon enough, a train will be parked in there and will begin making some laps around the track! Remember the tour last month? It looks like some mine shaft theming has gone up where the queue will pass through, behind the former Carousel Souvenirs shop. 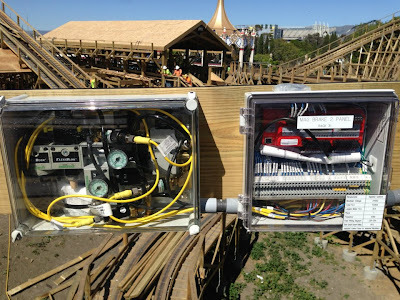 In the mean time, Irvine Ondrey Engineering, a company responsible for ride control systems posted some photos on their Facebook page, offering some unique views of the coaster. This view is from inside the station area. Looks like some soda machines have made way into the queue. 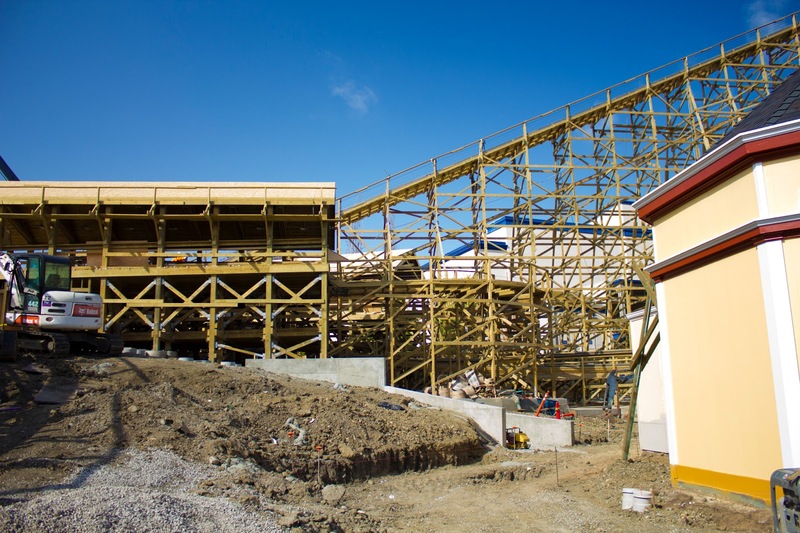 Also the lift structure looks like it should provide some nice shade from the late afternoon summer sun, while remaining open air. 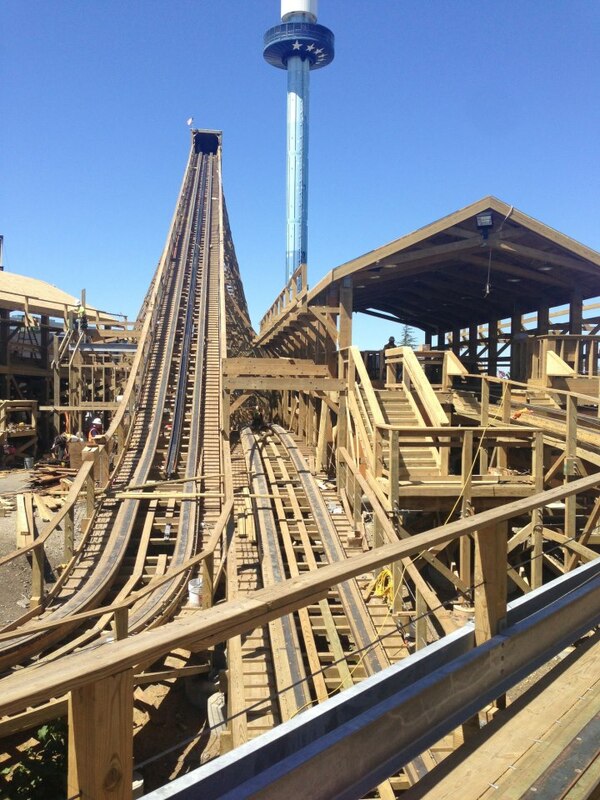 Gold Striker will feature a magnetic braking system to slow the cars down as they approach the transfer house. The magnetic brakes should produce a smooth, quiet stop, not to mention, less physical wear and tear on components. Here's a look at some of the control boxes, revealing that this is a magnetic braking system. Also you can see the massive 49ers stadium rising above in the background! 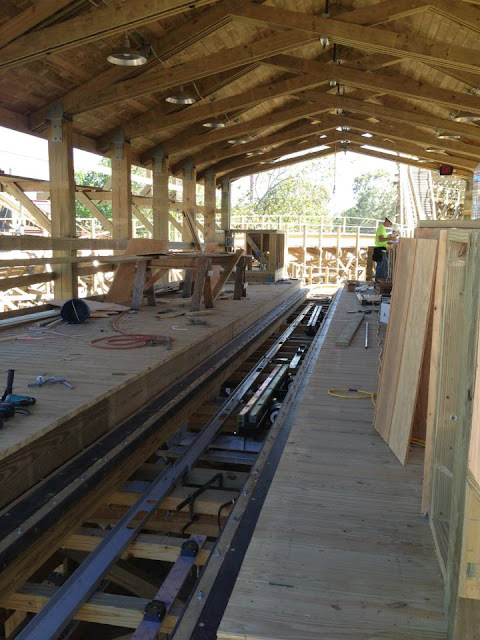 The station begins to take shape as a set of stairs lead up to the platform. It appears as though the path will come from under the station and pass by the flyby. In the mean time I hope people don't decide to throw goods onto an oncoming train at full speed. Another station view, this time inside the station. What initially looked like it was going to be rather narrow is now looking more like a standard station. 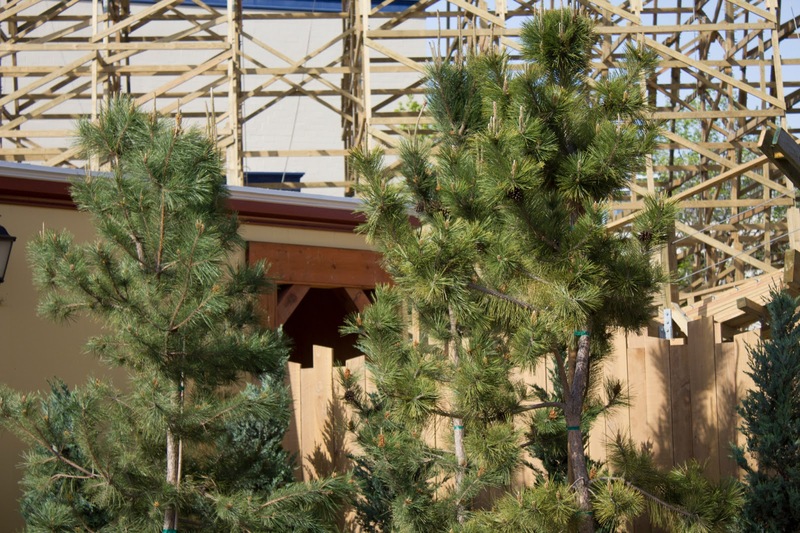 Unlike Grizzly's station that is quite massive and gets quite noisy and crowded, this one should be much less crowded while Fast Lane attendants let people up to the platform. 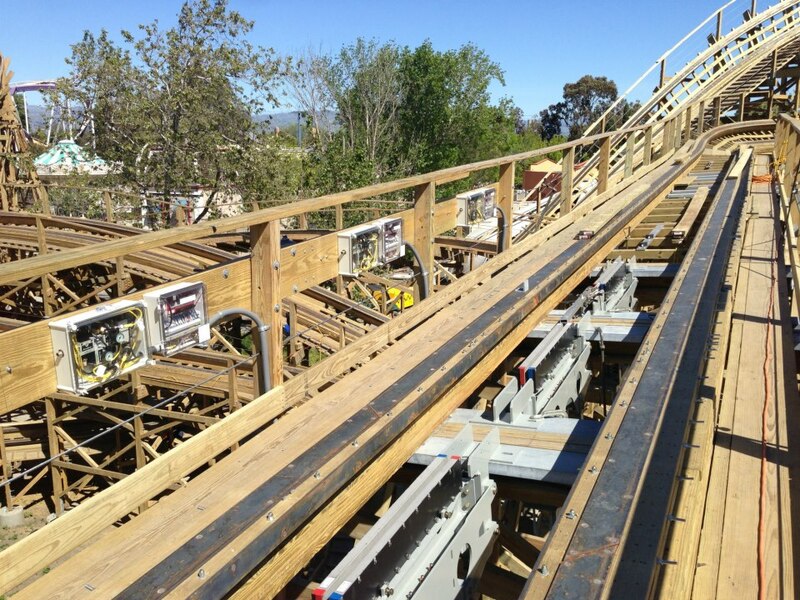 Stay tuned for future park and Gold Striker updates! 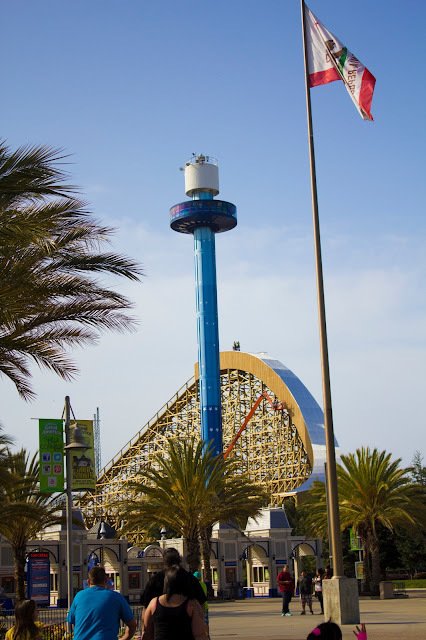 And be sure to give CGA Insider a like on Facebook for more park updates!